The Trident Maple bonsai tree is a popular choice for bonsai enthusiasts because it responds well to nearly any bonsai technique. Eye-popping fall colors from orange to red are another big reason for bonsai lovers to select this type of tree. While it is a durable tree, proper care is still essential to the success of this or any other bonsai specimen. Trident Maple, also known as Acer buergerianum, is a deciduous tree that prefers full sun and well drained soil. More drought tolerant than most other species, as a bonsai tree it will still need regular watering. During the hot summer this may mean watering it daily. In the winter you will need to water it less often to prevent damage to the roots from frost. Young trees need a fertilizer high in nitrogen while older trees need less nitrogen in order to produce the smaller leaves and controlled growth that is preferred in bonsai. During the growing season the Trident Maple bonsai tree will need frequent fertilizing; once a week for the first month of new growth in the spring and then twice a month after that. As fall approaches, you will want to change your fertilizer to one that is lower in nitrogen and higher in phosphorus to help your tree prepare itself for winter. The best time to transplant your Trident Maple bonsai is in early spring before it begins to bud. New trees should be given a year or two to become established before re-potting. After this, re-potting should be done about every two to three years. Once the tree has been re-potted, it needs to be kept in a cool, shaded place for about two weeks.Because this tree will grow vigorously just before it buds, spring is also a good time for pruning. Up to 65 percent of the roots can be cut back to fit its new pot without damage to the tree. Keep in mind that it is better to cut larger roots instead of the small feeder roots. Cuttings gathered in the early spring will root easily to start a new tree. You can also successfully grow this tree from seed. While techniques for growing bonsai from seed vary slightly depending in the species of tree, the Trident Maple grows well when the seeds are allowed to germinate naturally. In the fall, simply sow seeds outside in a shallow hole approximately one half inch deep. If you are unsure of the viability of your seeds, put them in a bowl of warm water for about 24 hours. Good seeds will float, but non-viable seeds will sink. Once planted, your seeds will sprout in the spring. 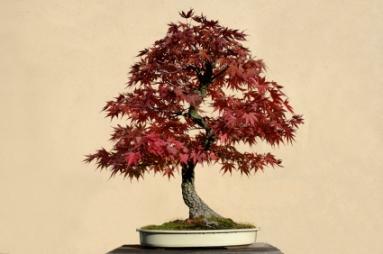 Because of its brilliant fall colors, the Trident Maple is a favorite at bonsai exhibitions. Exhibitions are not always in the fall so it is a common practice to defoliate some bonsai trees to create the desired effect. Defoliation, in essence, shocks the tree into a second spring growth cycle. If you have determined that this is necessary for your tree, a full defoliation is essential for a Trident Maple. Partial defoliation can do serious damage to your tree. To defoliate a healthy, well established tree you simply cut away the leaves with a scissors. Do not cut off the petiole, or stem, of the leaf. This will allow the petiole to continue providing necessary nutrients to the tree as it recovers from being defoliated. A defoliated tree still needs adequate lighting; however, it will not need as much water until it has budded again. Because the tree is now bare, it is an excellent time for any pruning that is necessary to keep it in the proper shape. Within three to six weeks you will begin to see new leaves which will be smaller than the previous ones.